Last night was brutal. I pulled an all-nighter in order to et all our shirts out for the New York and Vegas show we're doing in the next fee weeks. I had stayed up for a little more than 30 hours straight. When I tried sleeping last night my body was so exhausted that I couldn't even fall asleep. Crazy what our bodies are capable of. Also CTV is a Canadian television station that went to the Toronto convention and liked our stuff enough to include us in their blog. I came across this by searching 'akumu ink' in google images. Pretty cool! 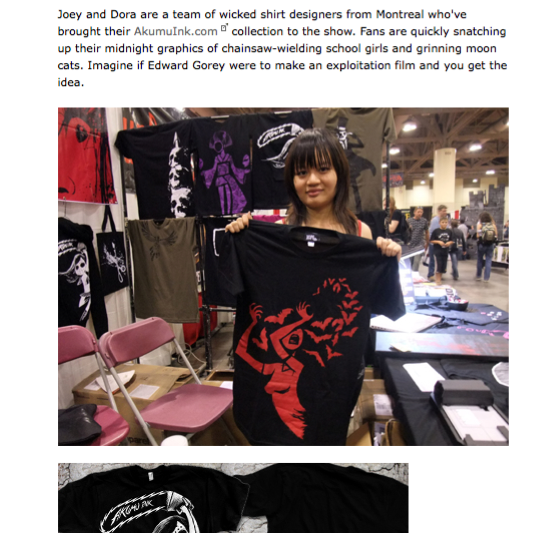 Here's the link to the post and a pic they took of Dora holding up our Starved tshirt.